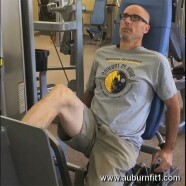 Try this Month’s Exercise to Notice at Auburn FIT1, the Single​ ​Leg​ ​Press ! Need an #exercise that works the #quadriceps, #hamstrings, #hips, #glutes, & #core? Practice the #SingleLegPress next time you hit the #gym!